A CONTROVERSIAL Indian ‘free-love’ guru and cult leader who spent 11 days locked in a room in a Limerick hotel in 1986 after he was banned from the United States for allegedly fixing sham marriages, is subject to a new Netflix documentary. 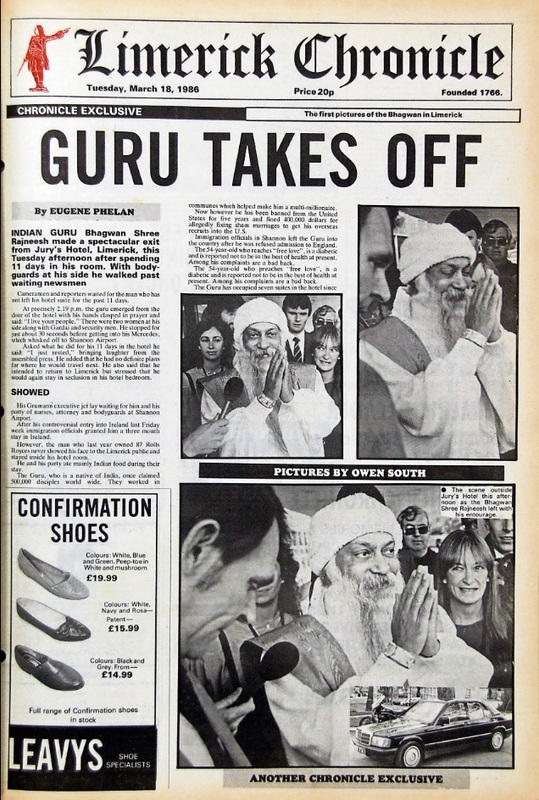 Bhagwan Shree Rajneesh, features in a Netflix documentary series Wild Wild Country, spent 11 days locked in his room in Jury’s Hotel, the Limerick Leader archives show. The details of the guru’s spectacular exit from Limerick were detailed in an exclusive written by the current editor of the Limerick Leader Eugene Phelan and published in 1986. 'There were two women at his side along with Gardaí and security men,’ the article reads. When asked what he did for his 11 days in the hotel, the Bhagwan told reporters: “I just rested,” which brought laughter from the assembled press. Wild, Wild Country focuses on the guru, his personal assistant Ma Anand Sheela and the followers of the Rajneeshpuram movement, also known as the Rajneeshees. The documentary looks at the group’s attempts to build a utopian commune near the remote town of Antelope, in Wasco County, Oregon, in the 1980s, much to the horror of the local community. The guru, who was also known as Osho, once claimed 500,000 disciples worldwide. He also famously had a penchant for Rolls Royces, at one point owning 93 of the luxury cars. While the guru preached ‘free love’, the Rajneeshpuram movement later came to be plagued by allegations of mass poisonings and claims that it attempted to influence local elections. Immigration officials at Shannon had granted the Guru a three-month visa after he was refused entry to England. He had been banned from the United States for five years and fined $400,000 for allegedly fixing sham marriages to get overseas recruits into the US. Leaving the hotel, the guru said he intended to return to Limerick but would again stay in seclusion. He was not in the best of health during his visit, it was reported.